What follows are those hot springs located in and around Lhasa, Tibet's capital which were originally in another posting, but changes / changes. Superlatives are used to describe the hot spring of Yangbajing (or alternatively Yangpachen) located in Doilungdeqen county, 87 km north of Lhasa. And arguably one of Tibet's most well-known. This in part is due to access; the hi-speed railroad to Lhasa passes here and there is a station, enable dieembakation. Even Micheal Pailin made it here, so why not join in? The Yangbajing springs are massive and are stated to be the highest altitude springs in the world. (Btw, Conumdrum hot springs (CO) are the highest in North America at 3,400m while Boliva's Termas de Polques hot springs are notched at 4,400 (close ...)). By Zuzi Griffiths. Though electricity was won since the 1970's, these pools were only filled in 1998 (1). The Yangbajing hot springs field is extensive. It apparently covers a large area (40 km2, no less, though wikipedia notes 20-30 km2) and besides including the bathing complex (see photo) and geysers, it is also a source for geothermal energy, enough to sustain half of Lhasa so is learnt. I even managed to find an internet entry on Duoji, claimed to be the expert driving the geothermal power project of Yangbajing. '... has both two indoor swimming pools and one outdoor swimming pool'. The Dezong hot spring (Maizhokunggar county) contrasts greatly with the prior featured hot spring. Devoid of development, the setting is rustic and accompanying this is the fact that it's mostly frequented by locals whose disregard for formal attire provides outsiders (surprise, surprise mostly males) with a carte blanche to highlight their possible ultimate dreams. What a load of info. Tibetan's have no lust? Local dogs do? Or do they really appreciate naked tourists? There was evidence that bathing in Dezong has been taking place for over 1400 years, which must be something of a record. 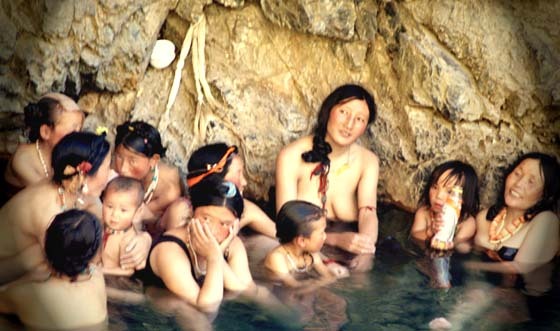 One of the more difficult factors when researching hot springs in Tibet is the lack of info foremost and the general confusement concerning the name. Often referred to as Tidrum (or Tirdum, Tridum, Tridom, Dedrom, Drigong) hot spring I believe may well be the same as the above. Pictures though are not conclusive. Experience though in both seems great. 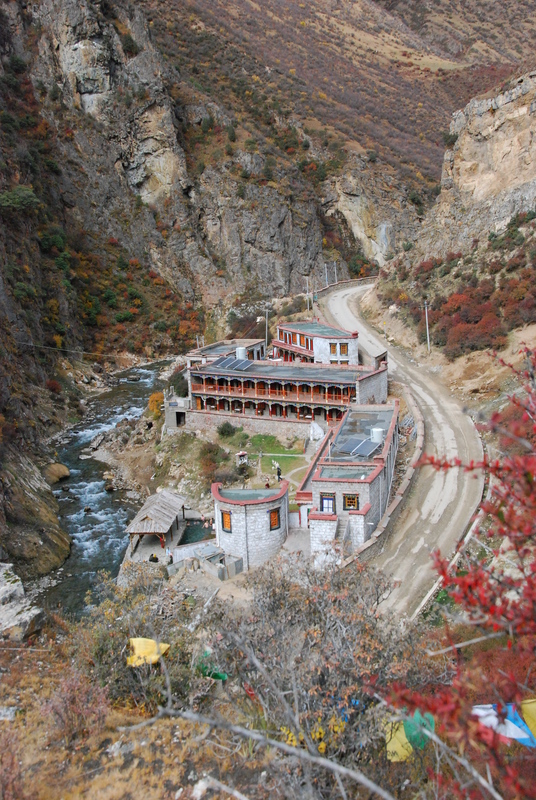 'Shambhala Source has 18 rooms overlooking the canyon ravine, hot springs and meditation caves. Six “Tantric space suites” are two-story accommodations with a bathroom featuring a hot spring tub on the first floor with seating, and bedroom with private balcony overlooking the ravine on the second floor. Six other rooms are standard size and also feature a hot spring in the bath. Six more rooms have unsurpassed views over the canyon but no hot spring water directly in the room. All guests may use the open hot spring pool which all rooms overlook'. 'We stayed 2 nights here. It's a beautiful spot in a river gorge and has mens and womens hot spring pools which are great if your are not too modest. Rooms are marginally clean enough and hot water was no problem. Service was weak and no one speaks English. The restaurant food can generously be described as simple but adequate. Not a great place but probably much better than monastery guesthouse alternatives'. Xungbara Qu gets one mention, that as a mini-hot spring in Doilungdeqen county (1). '... which are making good profits'. 'Qubsang Qucain is a hot spring(s) and is located in Tibet Autonomous Region, China. The estimate terrain elevation above seal level is 4551 metres. Variant forms of spelling for Qubsang Qucain or in other languages: Qubsang Qucain (bo), Qiusang Qucan (zh), 邱桑曲灿 (zh), Qiusang Qucan, Qubsang Qucain, qiu sang qu can, 邱桑曲灿'. Just one of the three photo's of Qusang hot spring. No subtitle. Qusang would be Tibetan for quality water (source) which makes more sense. 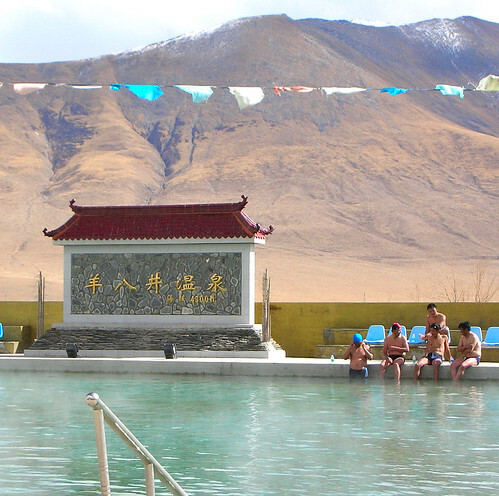 Other info includes the fact that this hot spring is only 60 km from Lhasa. 'The water temperature at the spring source of Riduo can reach as high as 81C, but in spite of that, there is a harmless little worm living in the water which the locals call "holy worms". This quote though seems to have partially disappeared from the internet, at least the latter part. What I did find was that Rutog's springs now are directed to a bottling plant. 'In Nyemo there is a very nice river where you could bathe in the winter. Along the banks were some places where you could dig down and the hole would fill up with hot water from an underground spring'. Thus wraps up this intro to soaking in Tibet and highlighting a few of many of Tibet's hot springs. In the above one must note that the sources used may not always be correct; be it concerning the name of the hot spring or the location. Harris, B. (1996) Tibetan Voices: A traditional memoir. Eds: H. Wardle , B. Harris, I. Marrs, C.S. Koller. Pomegranate, San Francisco, U.S.A.